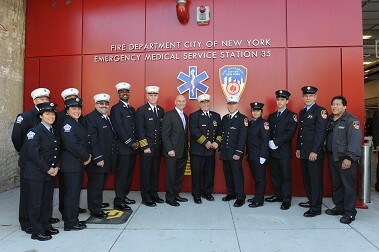 Brooklyn - Members of the FDNY opened a new, state-of-the-art facility on Sept. 30, the new EMS Station 35 in Greenpoint, Brooklyn. Sixty-five paramedics and EMTs work at the station, which was previously located at Woodhull Hospital. The two-story 12,400-square-foot facility includes an apparatus floor for four ambulances and a command vehicle. Seven ambulances will operate from the station, equaling 17 tours per day. During construction, Iron Worker John Stalzer suffered a serious heart attack at the location. But thanks to quick thinking bystanders and knowledgeable first responders, he survived. 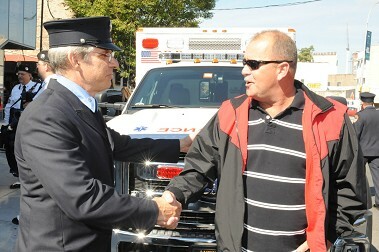 Days later, on Dec. 30, 2011, he met the FDNY EMS members and firefighters who saved his life. Mr. Stalzer and his family attended the Station’s dedication ceremony. The station was designed by Michielli & Wyetzner Architects and built by the Department of Design and Construction (DDC), who employed construction management firm TDX and Volmar Construction.